Each month we host a Graphic Novel Book Club meeting, open to all, during which we hang out and informally discuss a featured graphic novel. 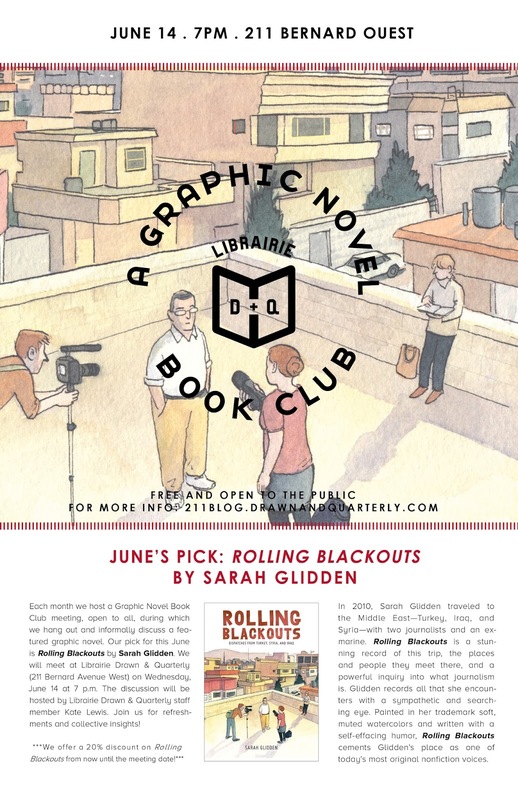 Our pick for this June is Rolling Blackouts by Sarah Glidden! We will meet at Librairie Drawn & Quarterly (211 Bernard Ave. West) on Wednesday, June 14 at 7 p.m. The discussion will be hosted by store staffer Kate Lewis. Join us for refreshments and collective insights! ***We offer a 20% discount on Rolling Blackouts from now until the meeting date! In 2010, Sarah Glidden traveled to the Middle East - Turkey, Iraq, and Syria - with two journalists and one childhood friend, an ex-marine. Rolling Blackouts is a stunning record of this trip, the places and people they meet there, and a powerful inquiry into what journalism is. The narrative draws you in with its insight and warmth in Glidden's distinctive, gorgeous watercolors.